Adapting a well-known real event into a movie is a tall order. It’s easy to put together a check list and just hit the expected beats. The problem is that taking this path leads to a dull film. When Paul Greengrass directed United 93, critics were ready to tear him down for exploiting 9/11. The fact that he managed to deliver an intriguing piece of cinema is remarkable. He created such tension from every moment despite the fact that the ending was certain. It wasn’t a star vehicle designed to draw big crowds with manipulative drama. 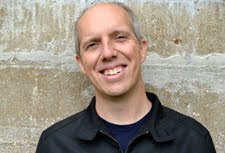 He used real participants in the tragedy and unknown actors to keep us engaged with the story on the screen. Greengrass employs a similar approach with Captain Phillips, which depicts the highly publicized hijacking of a U.S. vessel by Somali pirates. Despite the presence of Tom Hanks, the style remains clinical and doesn’t over sell the stakes. It’s another great achievement from a director who thrives on subverting our expectations. Based on the book A Captain’s Duty by Richard Phillips and Stephan Talty, this story puts you on board the Maersk Alabama and its lifeboat during the final act. Although it feels extremely spare, the screenplay from Billy Ray (Breach) is essential in building the tension. We spend a few minutes with Phillips and his wife Andrea (Catherine Keener) during a routine conversation on the way to the airport. This seems like a strange way to spend our time, but it sets him up immediately as a regular guy. He may be the captain of a ship, but Phillips is no super hero. When the reports of pirate activity grow, the grave concern on his face reveals the clear danger. Meanwhile, Abduwali Muse (Barkhad Abdi) has been tasked with recruiting a small group to steal the vessel. Instead of presenting them as unknown villains, Greengrass shows the young Somali men as equally important. There’s little surprise when they begin the furious pursuit of Phillips’ ship. This creative choice is pivotal in giving us sympathy with the pirates, especially Muse. Despite this even-handed approach, this film truly grabs you because of Hanks. Once the action shifts away from the Maersk Alabama, it’s all about Phillips and his four captors. I’ve seen most of Hanks’ performances, and few match the power of this role. He’s trying to stay brave and not show weakness, but there’s only so much that anyone could take. Much has been said about the last five minutes, and that scene more than lives up to expectations. 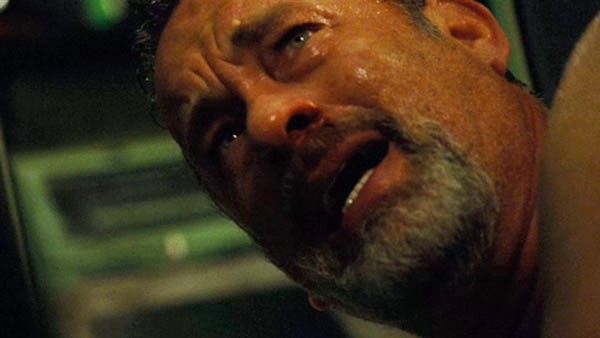 Hanks is so vulnerable after surviving the trauma, and watching him crumble is fascinating. We’ve moved so far beyond standard action movie territory at this point. Despite his criminal acts, it’s also disheartening to watch the fate of Muse after being tricked by the U.S. Navy. Despite the evidence to the contrary, he still believes that the elders will stand by him. Abdi does so well in showing the young man’s innocence in the brutal ways of the world. He may try to act tough with Phillips, but he’s hardly ready for the complexities involved. Captain Phillips received six Oscar nominations, including Best Picture and Best Adapted Screenplay. The stunning part was the lack of recognition for Hanks, who’s been showered with awards. Comparing the worth of performances is impossible, yet it still’s surprising given the power of Hanks’ work as Phillips. The unknown Abdi did earn a nod, and it’s a revelation to watch him reveal the layers behind Muse’s bluster. Greengrass and Ray give them the right environment to work, and the actors are sharp. It’s a gripping film that grabs you and won’t let go until the final confrontation. Even with our knowledge of Phillips’ fate, the resolution never feels secure. It takes a master to maintain that tension without manipulating the audience. This story could have fallen prey to the obvious formula, and its success offers a telling reminder of what’s possible in the right hands. I appreciated this for what it was, but I can't say I loved Captain Phillips. Abdi is fantastic, as you point out, and Hanks may have been overlooked. Then again, I wasn't really impressed with Hanks's performance until the last 10 minutes of the film where he's brilliant. The problem isn't with the film itself, but the subject matter. For me, this will never be as compelling a story as many others, so no matter how good it may be, there's a part of me that just can't get wrapped up in it. Steve, I can understand what you're saying about the subject matter. Part of me really likes the simplicity of the set-up. After the initial hostage taking, you basically just have four guys in a life boat for much of the movie. I also didn't know that much about the real-life story (beyond the ultimate result), so it was still surprising for me. Well said Dan. I'm certainly a fan of the film. It just missed my Top 10 of 2013 but not by much. I too was shocked that Hanks didn't get an Oscar nomination but that is the most crowded category of the year. The amount of great leading performances from last year is stunning. Keith, I agree that Best Actor is a loaded field, so Hanks' omission is more understandable. It's more surprising because it got a Best Picture nomination, but the others all seem deserving too. Regardless, it's impressive to see a guy like Hanks who could coast still doing such interesting work. 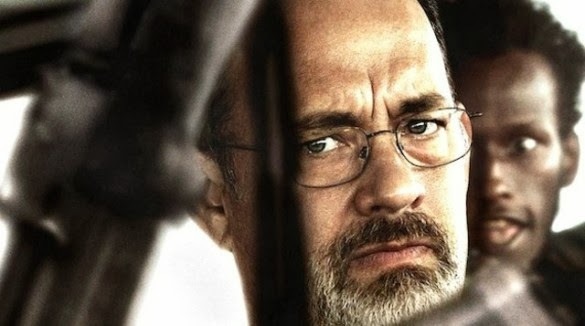 It is a shame that Hanks has been overlooked in his part as Captain Phillips. A big shame. Bug, from what I can see, the category for leading actor is jam packed this year. A tight bunch there. 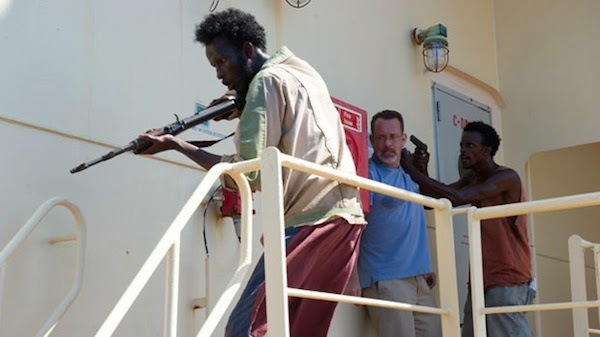 Captain Phillips is such a fantastic thriller - from beginning to end. Paul Greengrass puts his shakey cam technique to good use. Jaina, the interesting thing about Captain Phillips is that I barely noticed the shaky cam technique that was so prevalent in the Bourne films and United 93. That's probably a sign that I was very invested in the story. In my review I theorized that Hanks didn't get a nomination because people couldn't actually see his face to watch the various emotions play across it. When someone is speaking more than 70 percent of communication is non-verbal. With the heavy shakycam cinematography the camera never stayed on Hanks' face long enough to make an emotional connection. All that was left was the tone of his voice to convey the various emotions his character was feeling and that wasn't enough to beat out the other nominees whose performances could be clearly seen. Chip, that's an interesting theory about how the style from Greengrass (which earned him a Best Director nod) could have impacted Hanks. Like I mentioned to Jaina, I didn't notice the shaky cam as much this time. I'm sure it was there, but this was a pretty contained story once it hit the life boat. It's hard to say for sure, but there may be some validity to your theory. Good review, Dan! You are right that this could have easily been something lesser or generic in the wrong hands. Yet Greengrass, Hanks and Abdi had me on the edge of my seat for the entire time. Plus, Hanks performance in those final moments near the end is some powerful stuff. Definitely. It's a case like Apollo 13 where we know he's not going to die, yet there's still a bit of doubt because it's so convincing. I'd heard a lot before watching Captain Phillips about the last few minutes, yet I still didn't expect to be so moved by it. This was one of my favorite films of 2013 - edge of your seat right until the end when you're thrust off said seat and have to dust yourself off and get your thoughts together having just witnessed such compelling drama. Really enjoyed reading this review Dan. I think you're spot on about Greengrass - here he is technically and thematically spot-on, pitching terrorize-r with terrorized and giving us a somewhat balanced depiction of their individual ambitions. Two fantastic performances befit this incredible depiction of Phillips' true story that it is a shame Hanks missed out on the Oscar nomination. Thanks Dan. It was definitely a tense experience, especially when it came down to Phillips in the boat with the three captors. While I knew he'd make it out, that didn't lessen the intensity at all. I agree that this is an amazing movie and that Greengrass really managed to adopt it into something which feel realistic without it ever feeling like it is exploiting it. It shows the complexities of such a situation. Definitely. It's so easy to make this situation bad melodrama, and Greengrass always makes it feel legitimate. It helps to have such fine work from Hanks, Abdi, and the entire cast to make it easier.